Are you planning to remove your broken old vehicle that is occupying a valuable space somewhere on your property? Then of course you will want a removal process from our Car Removal Brisbane crew that is as easy as counting to five. This means convenient and quick collection services along with a handsome payment of instant money. 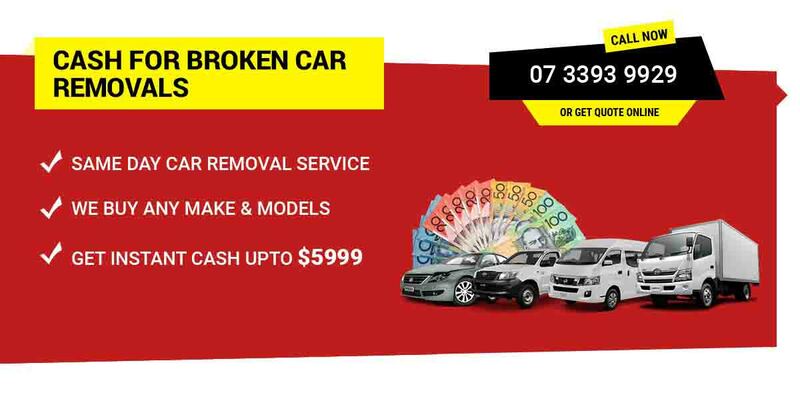 For this all you have to do is contact Qld Wreckers – the leading cash for cars in Brisbane, Queensland. We buy vehicles from folk just like you. And those vehicles don’t have to be of the vehicle variety. Along with the humble car, we also fork out top dollar for automobiles of all shapes and sizes. This includes vehicles such as trucks, 4×4’s, SUV’s, vans, Utes and 4WD’s. We are the most-trusted vehicle removal specialists in town, and we are known for providing completely fuss-free and fast collection services all over Brisbane, Rocklea, Toowoomba, Sunshine Coast and Gold Coast. Best of all, we pay instant cash for cars for vehicles of all manufactures. Our auto scrap yards are based in Rocklea. After gaining huge amounts of experience in a space of 20 years, we have mastered the skills of providing an easy and bother-free selling experience for all our customers. Consequently, we have made it simpler for salvage auto owners to get rid of their old machines by providing free towing services and heaps of cash in return. Additionally, our quick money quotes are obligation free and available 24×7. Since we have years of experience, our expert technicians are always accurate when it comes to paying fair money for vehicles. On top of that, they have a habitual bias toward offering more cash than anyone else in town. Hence, if you are looking for a collection service that can happily buy your used automobile for top cash, then we are the best possible company to deal with. We will pay up to $10,000 cash, depending on the condition of your make or model. Larger automobiles, such as trucks, can make even more due to the heavier weight in steel that they have. All you have to do is contact us and provide us with some key details pertaining to your automobile. This includes the basic information concerning your car’s make, model, age and condition. We will carefully analyse this information, draw upon our wealth of knowledge, and will give you a precise estimation straight away. Excited to get the best cash offer for your vehicle? Call us today at (07) 3393 9929. If the vehicle in question is totalled, unregistered or immobile, you have absolutely nothing to worry about. We will buy that vehicle off you regardless of any of those details. Why will we still buy your machine regardless of its condition? We are in the business of salvaging cars and recycling them. Even if the vehicle has no salvageable parts, there will still be steel and other materials that we can get out of it. This is why if your vehicle is a complete wreck this detail won’t disqualify your car from our purchasing power. Our Car Wreckers understand that there are companies similar to ours who specialise in certain makes. We feel that if we were to do the same. We would be unfairly denying people in our community the means to sell their junk auto simply due to its make. It is always our prime policy to maintain our client’s satisfaction and help them to sell their automobiles smoothly. And this is true regardless of the make or model. Whether it’s a Holden, Ford, Toyota, Hyundai, BMW, Nissan, Mazda, Subaru, Audi, Lexus, Hyundai, Isuzu, Suzuki, Daewoo, Ssang Yong, Volkswagen, Mercedes Benz, Kia, Jeep or any other major brand. We are always buying all brand makes and models. Our vehicle removal and pick up services cover entire Brisbane and its immediate suburbs. Therefore, it doesn’t matter in which part of Brisbane your vehicle is located we will be more than glad to collect it from you. Our capable drivers and well-designed tow trucks contribute in making the whole process of auto removal as enjoyable as possible for our customers. Qld Government is controlling air pollution from many years and always encourage people to get rid of the old vehicles that spreads pollution frequently. Furthermore, the great news is that taking advantage of our removal services won’t cost you a dime. This is counter to the practices of many other auto removal companies. They will either pay you less for your machine to make up for the costs. Or make you hire a tow truck yourself. This will be in order to transport the vehicle in question to their place of business before they look at it. At the end of the day, these practices only manage to make the amount of money you get a lot less than it would be. We want you to get the most money possible, which is why we perform our removal services for free! But that isn’t all. We will also have all the paperwork ready for you, so you don’t have to get it all together yourself. As soon as you sign it, you will get relieved of the huge burden of being in the ownership of a damaged vehicle. NB – We are your best choice because We pay more for your car. Interested to in reaping the benefits of our services? You can just make us a call or submit our easy online inquiry form with appropriate vehicle details. It is imperative because it will help us to come up with a precise assessment. This includes the make, model, age and condition your vehicle is in. Contact your local Car Removal Brisbane team today. We will get back to you with instant quote as soon as possible afterward.